Are you a cyclist, runner, or weekend warrior? Do you spend more time then you’d like sitting or on your feet? Has your flexibility decreased or you want to get deeper in your yoga poses? If you answered yes to any of these questions we have the perfect workshop for you! In this 2 hour workshop you will use RAD Roller tools and SMR (self-myofascial release) techniques to optimize performance, release tension, and increase your flexibility. The techniques you will learn will free up movement, move waste materials out of your soft tissues and joints and when used regularly, it will help unlock your body’s true movement potential whenever it fits in your schedule. All participants will receive a RAD Roller to take home! Restorative Teacher Training Level 1 . 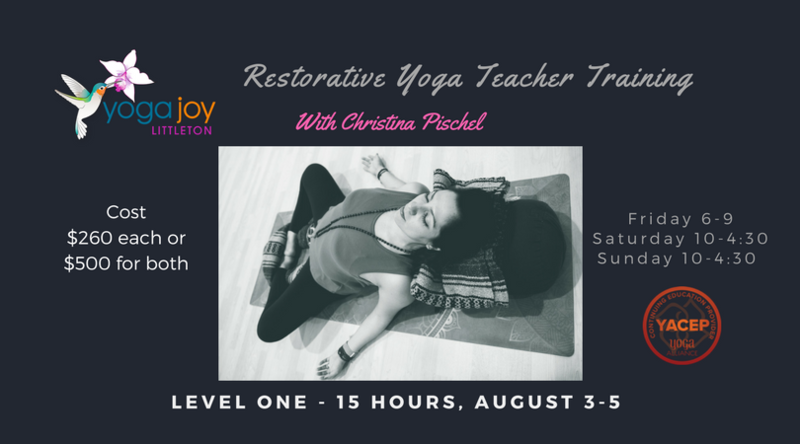 In this training you are given an in depth understanding of how the restorative practice can be used by to create balance, quit the mind, rejuvenate the body and mind, and learn the skills needed to skillfully and lovingly provide deeply transformative sequences through the use of your voice, verbal cueing, and props. 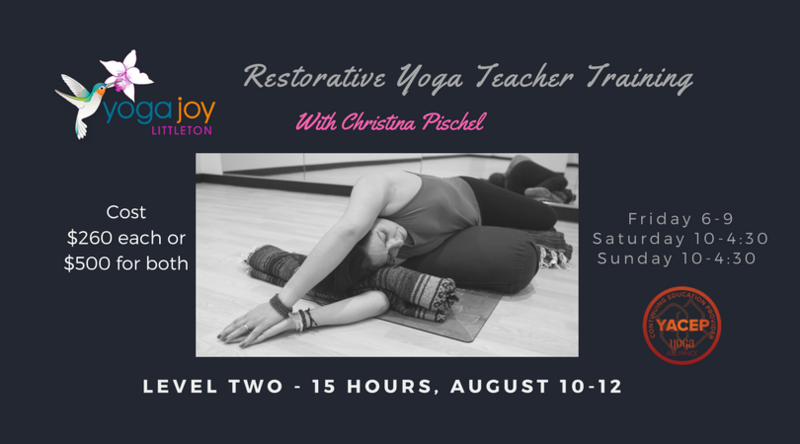 You will also learn about the subtle energetic body and how it relates to the restorative practice and how to assist each student personally to provide a customized pose based not only on their physical body but energetic needs. Upon completion, you will be able to thoughtfully create a restorative class, guide students safely and deepen your own restorative practice. You will learn from lecture, demonstration, partnered exercise and practice teaching. It is highly recommended that you continue with Restorative Teacher Training Level 2 to further your knowledge and experience. You will receive a certificate of completion which can be used for Yoga Alliance CEU Hours (15 hours). Restorative Yoga Teacher Training Level 2. In this training, you will further develop your understanding of the physical and subtle energy body in restorative poses. You will deepen your knowledge of the therapeutic impact of restoratives during times of illness, injury, pain, and other stress learning to support optimal energy flow to all the body’s systems. Emphasis is placed on expanding the breadth of your knowledge and experience with restorative poses, including working with special populations, managing more challenging situations, and individualizing prop use to address student’s unique needs. You will utilize props to provide modifications, and environment to help heal and transform your students. Upon completion, you will be able to create, guide and practice a customized Restorative Yoga practice for yourself and others as well as handle a wide variety of situations, injuries, and aliments. Upon completion, you will be able to thoughtfully create a customized restorative class giving consideration to illness, injuries ailments. You will have a deeper understanding of props and more advanced poses. Extra time is provided to practice teach to help you find your voice and comfort. You will receive a certificate of completion which can be used for Yoga Alliance CEU Hours (15 hours). Level 1 or a prior Restorative Training is a requirement. RYS 200 Hour Teacher Training at Yoga Pod Littleton. Interested in teaching yoga or deepening your practice? Join Christina Pischel and Estella Moore in this life changing experience. During this training you will lean how to breakdown and teach asana, explore the yogic journey including the 8 limbs of yoga, meditation, how to take yoga off your mat, Ayurveda and more. After this training you will have the tools to lead a vinyasa style class with confidence.